In middle school, our students utilize the reading skills they’ve acquired in lower school in order to explore literature in greater depth. By reading books tied to our curriculum either by subject matter or time period of composition, our students begin to build connections between historical movements and literature. Our literature group books provide us ample material for thought-provoking class discussions about concepts like love, equality, and ethical behavior. In addition, we study the way that authors craft their work, looking at how plot, dialogue, imagery, and figures of speech are used. 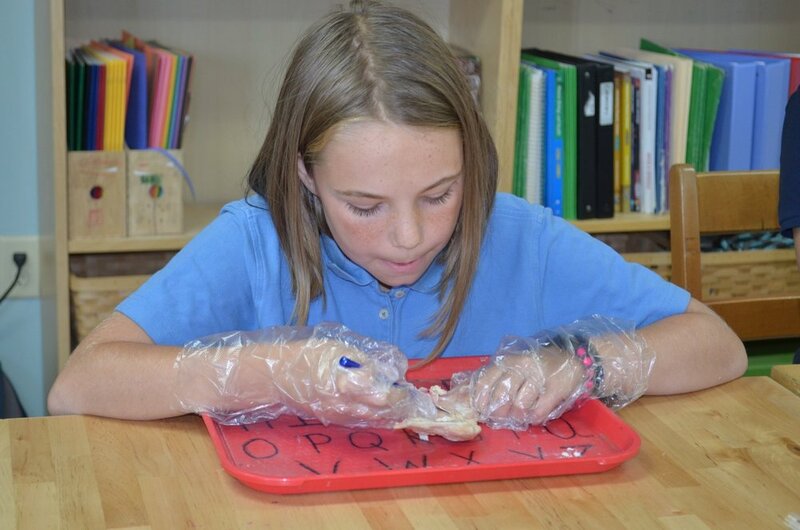 In spelling, students progress in fifth grade to a study of morphology, learning word roots, prefixes, and suffixes. Vocabulary and spelling are supplemented with Wordly Wise, a program that emphasizes a thorough understanding of words through their use in context. We teach grammar throughout middle school. Students learn to diagram sentences, use commas appropriately, and fine-tune their writing style through practice with different types of clauses and phrases. We believe that clear and concise writing is one of the keys to academic success, and so writing is one of the main focuses of our middle-school program. With a solid background in paragraph writing established in lower school, we can now move in middle school to writing different types of paragraphs, writing for different subjects, and writing long essays. Our students learn to write persuasive essays, literary analyses, biographies, book reviews, cause-and-effect essays, and comparisons. And they learn to use the same writing patterns in different ways to write about history, science, current events, social issues and literature. Middle-school students follow the same course of study for histories and sciences as the rest of the school, but spend more time in class studying these subjects. Readings and questions from a variety of texts precede class discussion, which is supplemented with individual, small-group, or whole-class activities. Our students begin a comprehensive study of Latin grammar beginning in fifth grade. Using the text Lingua Latina, we learn Latin vocabulary, morphology, syntax, and grammar, which provides a great introduction to study skills and helps with an understanding of the vocabulary and grammatical structure of English. As our understanding of Latin progresses, we are able to apply our knowledge to reading simple stories and texts in Latin. Fifth and sixth grade students typically continue to work in our Math Mammoth curriculum used in lower school. 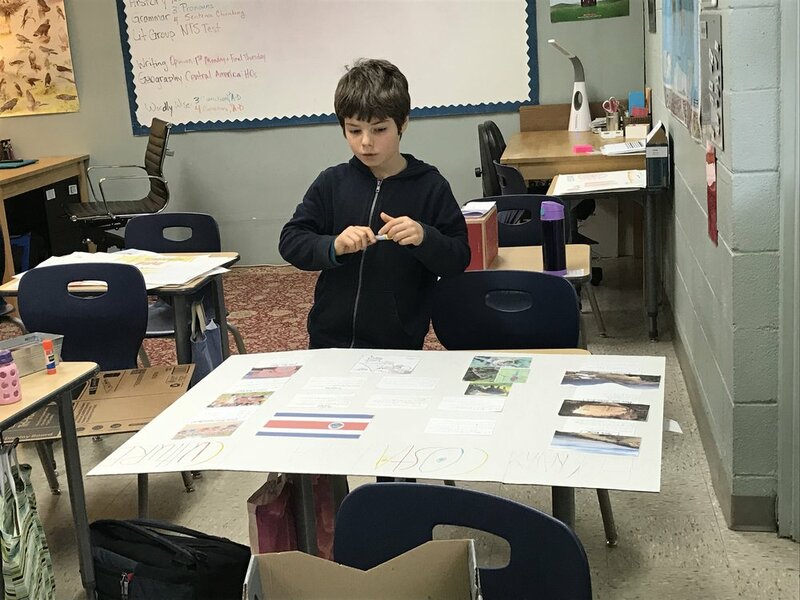 As they progress through each year, they cover the same basic math concepts at increasingly complicated levels, building on past knowledge and expanding on it with a view toward Algebra and Geometry. We typically offer Pre-Algebra and Algebra in seventh and eighth grade. We maintain a lot of flexibility in math placement in middle school, making sure that every student has mastered the skills needed before moving onto the next level, and that students are never held back from meeting their potential simply because of grade level. Students in middle school receive weekly assignments for each subject that they are expected to complete and turn in by Friday. Time is specifically allotted for homework completion at school in two teacher-supported study halls each week. Students in fifth and sixth grades should expect to have 30 minutes of homework each night during the week, while students in seventh and eighth grades should expect 60 minutes of homework each night.